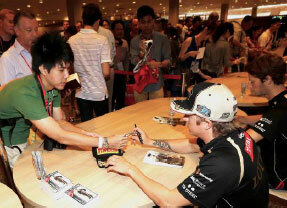 18 Feb 2013, Singapore – 65,000 general three-day tickets for the 2013 FORMULA 1 SINGAPORE GRAND PRIX will officially be released for early-bird sale from 20 February 2013 (0900 hours, Singapore time). Fans will enjoy significant savings and new initiatives for the sixth instalment of the world’s only Formula One™ night race on 20, 21 and 22 September. As in previous years, race promoter Singapore GP will release the tickets in two phases: the early bird phase (20 February to 30 April 2013), as well as the regular phase (from 1 May 2013). Approximately 85% of the ticket categories on offer are priced the same, or lower than last year. "As we embark on a new five year contract with Formula One, it is important for us to constantly look at ways to enhance the offerings each year to engage our fans. Our pricing structure continues to offer fantastic value for a premium sporting event, which allows patrons to enjoy spectacular race action and a star-studded entertainment line-up with just the one ticket," said Michael Roche, Executive Director of Singapore GP Pte Ltd.
"We were extremely encouraged by the positive response to the Combination Packages an additional option this year. The highly successful Group Booking Specials are being offered again, so that fans can continue to enjoy significant savings if they buy as a group." Fans can look forward to enjoying savings of up to 30% if they buy now as a group under the Group Booking Special scheme. This scheme offers significant savings for fans who purchase four or more tickets for the Pit, Padang and Bay Grandstands during the early-bird phase. In response to popular demand Singapore GP is introducing an additional Combination Package, which offers spectators the flexibility to explore different parts of the Circuit Park on each of the three days. Fans can opt for the new Zone 1 Walkabout Combination package that consists of a Pit Grandstand ticket for both Friday and Saturday, as well as a Sunday Premier Walkabout ticket at only S$688 during the early-bird phase. The Turn 1, Padang and Bay Combination packages will continue to be available from S$398 to S$788 (early-bird price). through Singapore GP's authorised agents will automatically be entered into the draw. Winners from the ballot will receive a pair of tickets to the autograph session and an exclusive pre-event cocktail reception. Applications for this draw will close on 1 May, 2359 hours (Singapore time). www.singaporegp.sg, via the ticketing hotline +65 6738 6738 as well as all SISTIC outlets from 20 February (0900 hours, Singapore time).